Buybest loves to hear every shopper’s feedback, to help us improve. In order to encourage high quality product comment, we do a campaign. 1. Order any one product on our site. 3. When your comment is uploaded, it will be pending for review. At this moment, you can email to info@buybest.com, telling us which reward you prefer, gift card or points. 4. When your comment is approved, we will give reward to your buybest account immediately. Plz check then. 1. Your comment must be original, can not copy any content from our store or other sites. 3. You can write your real user experience on the product or our website, etc. 1. If you don’t want to write long comment, welcome to leave short comment and get points. 2. Welcome to comment with pictures. Additional 10 points will be sent to you if you comment with pictures. 3. Buybest has the right to change terms. This campain could terminate in the future, plz hurry up to comment. We will reward all approved comments. 4. The reward value cannot exceed the price of what you bought items on buybest. 5. One can only get gift card once for one product. We lay emphasis on your reviews/comments/opinions/shopping experiences on our products/our site/anything releated with buybest, because this could make us grow and improve better. Note: your review post must contain our link: https://www.buybest.com or product link or buybest.com text. Your post needs has views/comments. Send your review/comment links and screenshot as a proof to info@buybest.com. 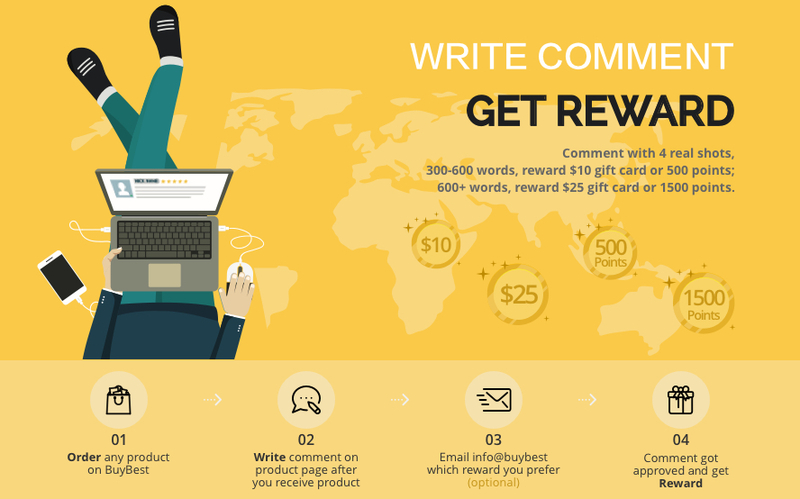 Your submission will be checked and we’d give a reward from $2 to $40 to you, via your buybest account. We’d love to send FREE Samples to your door to superior reviewers. We’d reply your emails within 2 business days. And process the reward within 4 business days after receiving your first email. Affiliates, Dropshippers and other partners are not eligible for this event. Group buying shares are not eligible. We have the right to give you different value, maily based on your reviews' views, shares, comments etc. Not every review application will receive a reward.